With Karl-Anthony Towns's contract extension in place and Jimmy Butler on his way out of town, the Timberwolves and their franchise player are both now saddled with new expectations. While the basketball world spent the weekend wondering where exactly Jimmy Butler would be come Monday, the Timberwolves, as it turned out, were doubly busy, coming to terms on a five-year, $190 million supermax extension with franchise center and 2015 No. 1 pick Karl-Anthony Towns. Of course, September has not been Minnesota’s month, with Butler’s very-public unhappiness and semi-public feud with the Andrew Wiggins camp taking center stage and irrevocably shaking the franchise’s chosen narrative—that the Wolves are an evolving young contender with their best days ahead of them. From a basketball standpoint, locking Towns up long-term is a no-brainer, but given the circumstances, it’s also a Machiavellian bit of timing for a press release. The cloud of Timberwolves owner Glen Taylor’s reported intent to trade Butler as soon as possible casts the Towns deal as a welcome distraction. There are the reports that coach-slash-president-slash-dictator Tom Thibodeau apparently doesn’t want to part with Butler, to whom he anchored his tenure via a 2017 draft-night trade that has not ripened with hindsight. When Minnesota opens training camp Tuesday, Butler won’t address the media and ownership wants him on the move before it starts. It’s the only thing running the news cycle as preseason begins, and at this point, it's a black eye for the Wolves. There are also rumors of Butler and Towns’s relationship as one of many grown fraught. It was always pretty obvious that the team would pony up to pay Towns, but announcing it amidst the tumult feels like Taylor publicly crossing his arms and clenching his jaw. Deciding to show Towns the money probably doesn’t require much second-guessing. He’s been extremely consistent, averaging a double double in each of his first three seasons. He’s shown improvement statistically, upping his shooting percentages to cool 54.5%/42.1%/85.8 % splits. He’s also—knock on wood—never missed a game, making 246 consecutive starts to begin his career. There’s been deserved scrutiny surrounding his defensive impact, but Towns is the type of talent that can and should command max money at this age without many questions asked. He’s always been the future, irrespective of Butler’s mood or Wiggins's maturation. For the Timberwolves, the scary part is this: even with Towns, who is somehow still only 22 years old, on board long-term, the stakes have been immediately raised. This was going to happen eventually, as it does with all young stars, but thanks to the Butler situation, it’s no longer happening on Minnesota’s terms. The money puts a target (no pun intended) on Towns’s back that demands results in an unforgiving conference. Wiggins will become an uneasy second banana whose counting stats may not be able to cover for his average per-possession efficiency—particularly as a shot creator—much longer. The type of return they get from a Butler trade (or perhaps its average age) will be telling. Needless to say, banking on a cast of veteran role players to prop Towns and Wiggins up this season could prove a difficult bridge to sell. The timing of all this is certainly unfair to Towns, who deserves another year or two of patience as he evolves—hopefully into the type of star that can set the tone for a the franchise that’s seen top players depart time and again. Butler’s trade demand follows that precedent, and the timing of Towns’s contract announcement is a stab at wrestling back control. From an optics standpoint, ownership is probably right to expedite the deal: the sooner it happens, the quicker the team can start reframing its own arc around the parts that remain. 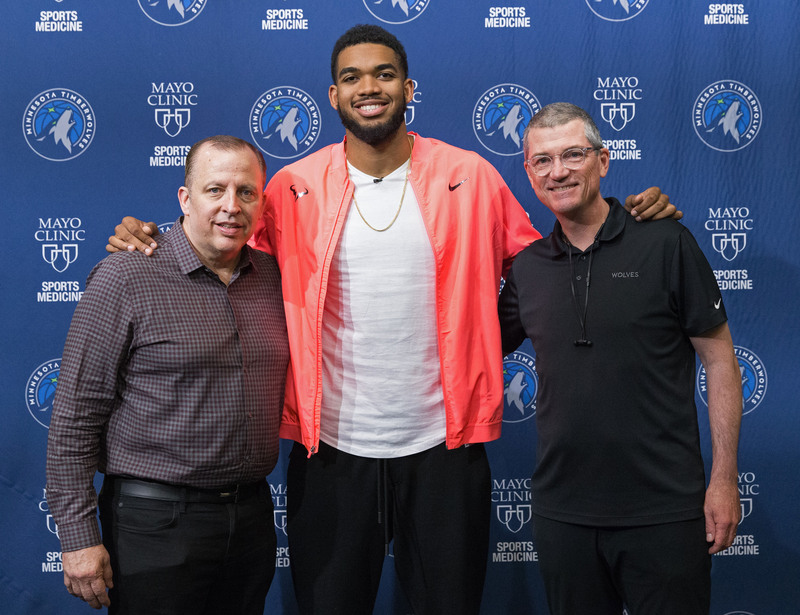 The Timberwolves are paying Towns to produce at a pivotal time, his dollars now immediately saddled with the collateral damage of expectation, and the responsibility of propping up an organization that needs results. He’s not only the heart of the plan—he’s the one who has to prove it’s even viable. For better or worse, welcome to Minnesota’s 2018–19 season.